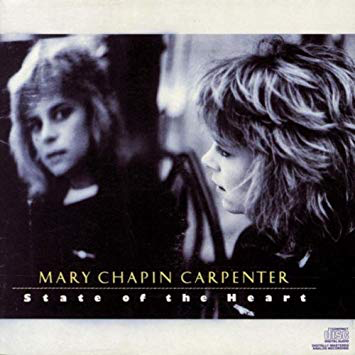 After her stunning, underrated debut, this is Mary Chapin Carpenter's second album of gentle non-steel guitar country ballads and mid-paced catchy electric country rock. Like on the debut, there are some really gorgeous, moving songs on here. It is probably slightly more "country" in its sound than the more folky debut. "Something Of A Dreamer" starts the album off in mid-tempo, acoustic style which builds up to have a bit of a rock beat at the end, but it is still a laid-back contemplative country number. "Never Had It So Good" sees a full electric band come in, but it has that dignified, stately medium pace and Mary's soulful, country voice, free of Southern twang, replaced by emotion and a quiet, wise sexiness. "Read My Lips" is Mary at her most country-ish, which in her case, often means quite bluesy too, which I love about her. She merges country with the blues at times, which makes for a good combination. "This Shirt" is one of those beautifully emotional MCC songs. She gets nostalgic about her old denim shirt, which is a really quirky idea for a song. It has some moving and heartbreaking lines in it - "this shirt was the place where your cat decided to give birth to five, we stayed up all night watching and we wept when the last one died....". See what mean? "This shirt is the one I wore to every boring high school dance, where the boys ignored the girls and we all pretended to like the band...". Wryly observational MCC at her very best. Only Mary Chapin could write such a genuinely moving song about a shirt. She wear the shirt now for "Sunday chores". It is now a "grand old relic". Mary and her shirt now have that status for me. "Quittin' Time" is one of the first of the full-on electric country rock numbers that would populate her next three or four albums - powerful, singalong and in possession of a killer hook and guitar riff. "Down In Mary's Land" has her declaring her love for all things rural and country, suitably backed by a melodic fiddle. "Goodbye Again" is a slow, tender, sensitive song about marital infidelity which sees Mary showing wisdom beyond her years. "Too Tired" is another bluesy rock-ish grinder with some upbeat bluesy guitar-driven rock parts. "Slow Country Dance" is a bit like "Waltz" on the previous album - a ballad sung over a slow country waltz beat. "It Don't Bring You" is a gorgeous song to end the album on. Again, I have kept using the adjective "sensitive" because there is no other one - that is what the songs are, wonderfully so.